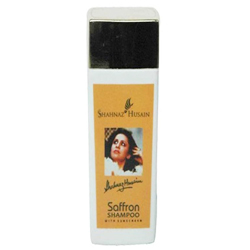 A Powerful hair cleanser, with a gentle action, it has been specially formulated for all hair types. Contains sunscreens to provide day long sun protection to exposed hair. Helps in combating premature graying. Wet hair, apply on scalp, work into a rich lather and leave for two minutes. Rinse off with water. Sodium Lauryl, Ether Sulphate, Saffron, Tulsi, Neem, Benzophenone-4, Menthol.